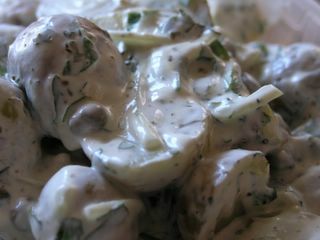 Just a very quick post to share my potato salad recipe. I made this for the wedding, too, and it was really popular! Most potato salads that you buy ready made are so-so - I won't eat them at all, generally, due to the high fat halt and the in general yucky texture. But this one was a lot nicer. I'm still not a huge fan, but Per adored it and wants me to make it all the time now. I put all the herbs in the food processor - I was making massive amounts of this, and if you're just making a little, coarsely chop by hand instead. As for amounts, I used mostly parsley, then coriander, not so much mint, and just a little bit of basil. Adjust to your own likings. Mix a large dollop of yogurt with a small dollop of mayo. Add salt, pepper, capers, onions and all the herbs. Toss with the still warm potatoes. And that's that. Easy, isn't it?